Physical Properties and Steam Approximation for Excel calculates thermodynamic and transport properties of gaseous, liquid and solid materials (TP, HP and SP), according to U. S. customary and International units, and steam approximations for both saturated and superheated areas. Physical Properties and Steam Approximation for Excel is ideal for those who are involved at various levels with design, operation and management of energy conversion systems. 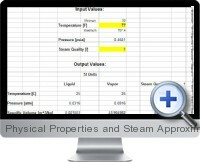 Physical Properties and Steam Approximation for Excel provides the user the opportunity to quickly, easily and effectively do his/her work, explore more options, save time and give more confidence in carrying out engineering calculations.